The commander of Iran’s army said on Tuesday that the Islamic Republic would destroy Israel at all costs despite the recent nuclear deal aimed at reining in the country’s rogue behavior, according to comments by these officials. Ataollah Salehi, commander of Iran’s army, said that no matter how many weapons are given to Israel, "we are going to destroy them," according to comments reported in Iran’s state-controlled press and independently translated from Persian for the Washington Free Beacon. The comments follow reports that Iran has unveiled new advanced military hardware and intends to violate international prohibitions on its construction of ballistic missiles, which could be used to carry a nuclear payload. "Israel only barks, no matter how much weapons are given to [it], we are going to destroy them, we will promise this task will be done," Salehi was quoted as saying by the Fars News Agency. Salehi expressed pride in Iran’s support for terrorist groups such as Hamas and Hezbollah that seek the Jewish state’s destruction. The military leader also said that Iran has been directly responsible for attacks on Israel. "We are glad that we are in the forefront of executing supreme leader’s order to destroy the Zionist regime," he said. "They have been hit by those supported by us [Iran] even though they have not confronted us directly; if they confront us directly they will be destroyed." 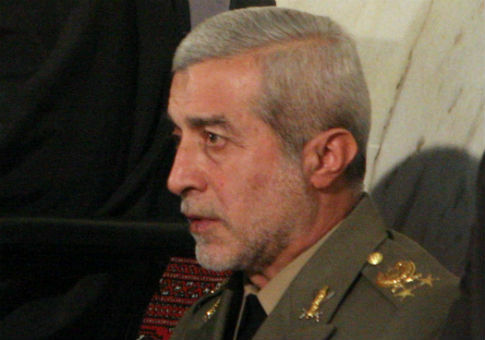 Meanwhile, other Iranian military officials lashed out at Republican politicians in the United States, claiming that they do not have the strength to start a war with Iran. "The backward Republicans want to go back to the era of the mad [President George W.] Bush," Hassan Firouzabadi, chief of staff of the Iranian Armed Forces, was quoted as saying in separate comments. "Bush did all he could to invade Iran but was not successful." Iran views such threats as empty rhetoric. "If Republicans want to take Bush’s path, they cannot start a war with Iran, war will not benefit them, what Republicans say are just empty words," Firouzabadi said. Saeed Ghasseminejad, an Iran expert and associate fellow at the Foundation for Defense of Democracies, argued that Iran’s military has become emboldened by the Obama administration’s rapprochement with Tehran. "Due to the extreme weakness shown by this administration, Iran’s military establishment neither fears nor respects the U.S. anymore," Ghasseminejad said. "The U.S. faces a credibility problem in the region; the problem will be there as long as President Obama is in office." Iranian leaders also vowed earlier this week to violate portions of the nuclear deal that seek to restrict Iran’s construction of ballistic missiles and arms. Instead of abiding by the United Nations Security Council Resolution, which was recently passed along with the terms of the nuclear accord, Iran’s leaders insisted that they may violate any restrictions without facing repercussions. This entry was posted in National Security and tagged Iran Nuclear Deal, Israel. Bookmark the permalink.